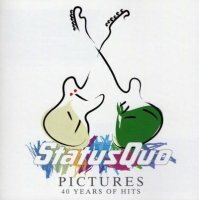 Every year seems like another anniversary for Status Quo which means its time for yet another compilation. The good thing about ‘Pictures’ is that it is biased towards Quo’s earlier career and for my money mid-seventies Quo is certainly something to admire while much of their post seventies material is debatable. If you can stomach the likes of ‘In The Army Now,’ ‘The Anniversary Waltz (Part 1)’ and ‘The Party Ain’t Over Yet’ then disc two won’t be much of an issue for you but others will find it very patchy.